In the West, Eiji Mikage is known as the mind behind some niche but beloved mystery light, and not-light, novels. He’s best known outside of Japan for creating The Empty Box and Zeroth Maria, a light novel series currently being published by Yen Press. 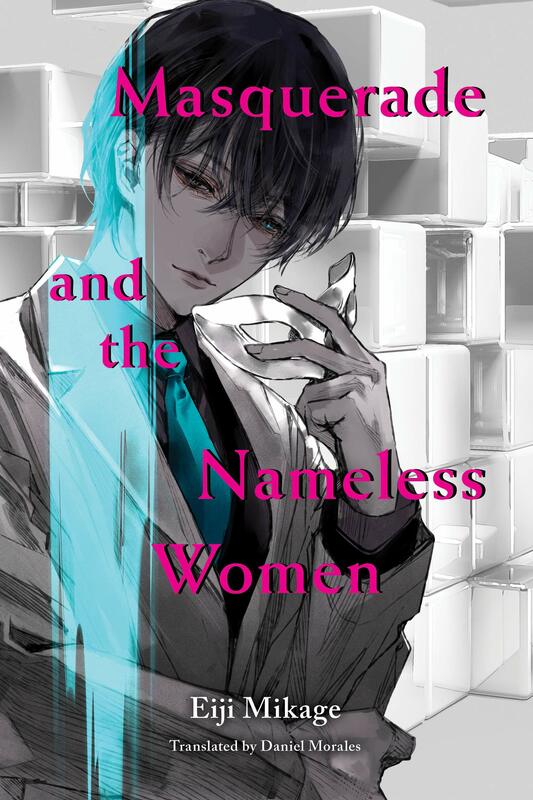 Today, however, I’m here to talk about his latest work to make it to the English market, Masquerade and the Nameless Women, and find out what it offers the mystery genre. When a case proves too difficult for the police to solve on their own, Yuri’s senior officer, Enishi Yamaji, calls in long-time consultant psychologist Seiren Higano. However, unbeknownst to Yamaji, Seiren is actually the serial killer Masquerade! With a case full of twists and turns, is Seiren behind this murder? If he is, will he be caught? There are many questions to be answered, and author Eiji Mikage is delighted to keep you guessing until the very end. This case hits close to home for Yuri. The victim was Reina Myoko, an old high school classmate of Yuri’s, whom she didn’t consider to be a friend but still remembers, thanks to a conversation the two once shared. Yuri’s gut feeling is that the killing is the work of Masquerade, but as they investigate more, she realises that the murder isn’t clean enough. Masquerade is known for cutting off one body part of his victims, taking them with him as some kind of trophy, as well as cutting off a victim’s face. In this case, Reina had her face removed as well as a foot, but the foot was planted in her boyfriend’s apartment. Once Seiren begins working the case, Yuri’s focus starts to drift to other suspects as he offers solid answers to the questions she has. In a game of cat and mouse, Seiren begins building a convincing story framing someone close to Reina, and although Yuri has her doubts, she can’t seem to shake the fact that everything Seiren says makes sense. Although I already knew of Eiji Mikage’s work, this is the first one that I’ve read. Being a mystery and crime novel, Masquerade and the Nameless Women combines some of my favourite genres to offer a compelling story that I was hooked on from start to finish. I’ve mentioned in previous reviews that when I work out the end-game of a mystery in advance, I start to lose interest. In the case of this book, Mikage sidesteps the issue by revealing right from the beginning that Seiren is Masquerade. He may or may not have been behind this murder, but nevertheless the focus shifts from that to the cat and mouse game that ensures. Masquerade and the Nameless Women is very intelligently written and nothing is obvious to the reader at the start. Pieces of the puzzle only fall into place as Mikage wants them to, never sooner. The book never leaves you waiting too long for answers to your questions but always cheerfully adds a twist to put you back at square one – acknowledging that you weren’t wrong, things are merely different now. Another point in Mikage’s favour is how well written the story and its cast are. Yuri, Seiren and Yamaji have realistic personalities and relationships between them. Yamaji trusts Seiren, and as Yuri’s senior that feeling is passed onto her yet never stops her from thinking there’s something ‘off’ about the psychologist. Seiren, for his part, is presented as a sort of modern day Sherlock Holmes, but, as a reader who already knows his secret, it’s interesting to watch how he’s presented and the lengths he’ll go to in order to frame someone. Sometimes you wonder if this man really is Masquerade, but then he’ll say or do something that snaps you back to your senses. The murder case is also believable, especially when you discover that Reina was tangled up in some tricky situations that definitely could have contributed to her being murdered. It does somewhat push the boundaries of realism here and there but never enough to break the illusion. It’s very clever, and Mikage has obviously worked extremely hard to polish this story and cast to the point of being so flawless. Of course, credit should also go to translator Daniel Morales, who manages to bring the novel to life incredibly well. What made me appreciate Morales’ work most is a sequence where the police are interviewing suspects, and rather than an open dialogue between the interviewer and interviewees, we only see the scene through the suspects’ dialogue. In this sequence the writing has to convey what questions are being asked, the mental state of the each character, and their answers. It’s a pivotal section and was no doubt difficult to convey in English. It’s honestly quite difficult to put into words how much I enjoyed my time with this story. I came away from it eager to read more of Mikage’s works, confident that this isn’t a one-hit wonder but more a mark of his talents. This release comes to the UK thanks to publisher Vertical and has a captivating front cover illustrated by Hiro Kiyohara (the artist behind Another’s illustration). The cover is striking and conveys the mysterious nature of Seiren (who is the character depicted) well. As this is a novel rather than a light novel, there are no other illustrations, which makes this cover image all the more impactful. Overall. Masquerade and the Nameless Women offers everything I could want from a mystery novel. With a satisfying story, believable characters, and compelling twists and turns, this book is a real page-turner. If you’re even remotely a fan of the mystery genre then you need to own this book – it’s as simple as that. Anime Boston weekend means new announcements from distributors! Here’s what Vertical have to offer!